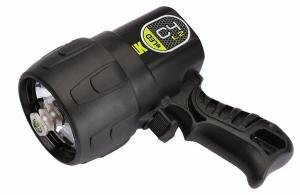 The C4 eLED L2 is a major upgrade to one of the world's favorite dive lights. Boasting a significant increase in lumen output, new optics innovations, and all the good stuff you loved about the original C4, you'll love the L2 for any type of diving. Available with standard alkaline C-cell batteries, or with an optional upgrade of a rechargeable battery pack. Get up to 1000 lumens of light with the NiMH rechargeable battery, which is approved for airline travel in checked baggage, and will last 10 years with proper care. You'll notice the difference with UK's patented optics system, which guides nearly 90% of the lumen output to the center of the beam. This reduces glare and backscatter, and results in a greater seeing distance. Many other lights only focus 40% of their total lumens in the beam, the rest being lost in the periphery. This is why the UK C lights look brighter than other lights that may claim a higher lumen number.